Take our free, guided walking tours today! Click on a tour for more info. The schedule is updated during the last week of every month. Open schedule in new tab. You don’t need a booking, just show up at the meeting place in time for the tour to start. Dress for the weather! If it’s cold, wear layers of clothing and hats and gloves. Please write us a review after the tour. Groups of more than 9 people must contact us in advance here or book a private tour here. School classes and groups of students must book their own private tours here. Click here for more detailed info about large groups. All tours take about 90-120 minutes and are about 2 kilometers long. The tours have different starting points. For more info take a look at the maps below. Read more about each tour. No need for reservations! You don’t have to book in advance or pay any fees to participate in our tour. All you need to do is show up. Pretty easy, right? Our Free Tours are aimed at individual visitors and we reserve the right to turn away unannounced large groups, but we really don’t want to. Please contact us at least 3 days in advance if you want to bring a lot of friends. We do not offer Free Tours to schools or other organizations. Instead, book a very reasonably priced Private Tour by contacting the guides directly. 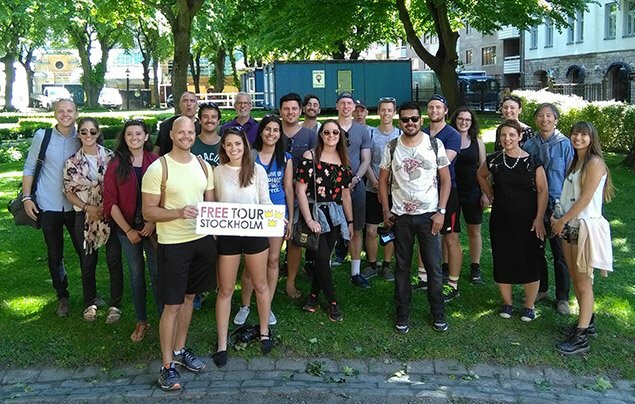 Our guided walking tours in Stockholm are totally free so that everybody, regardless of budget, can discover this amazing city. Our expert guides show you the sites and tell you about the city’s history during our interesting and entertaining 1,5-2 hours walking tours. Our tours are absolutely free. There are no fees. If you want to, you can tip your guide at the end. That’s it! So how come we give tours without charging money for them? Because our guides work only for tips, they’re guaranteed to do their very best during every tour. They’ll never pressure you to donate, even though they don’t get paid any other way. We believe that if our guests decide to give money, it should be completely voluntary and in direct proportion to the quality of the tour and the budget of the traveler. We’re always working to make our tours better, both because it’s more fun to give a great tour, and because the better the tour, the more tip for the guide! Some of the Free Tour Stockholm gang! 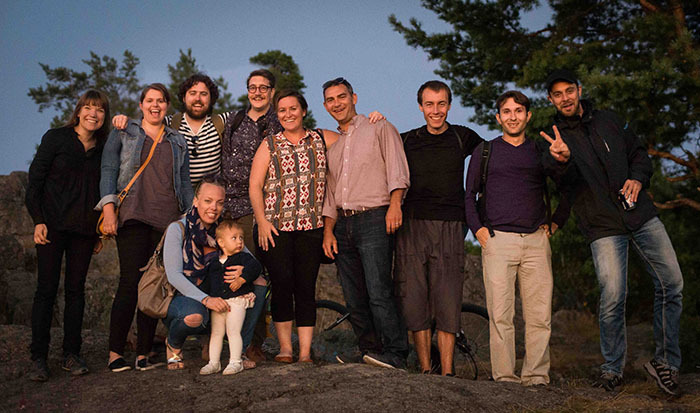 From left to right: Founder Annelie, guide Monica, guide Anton, founder Freddie, guide Amelia, guide Lee, guide Zenid, guide Peter, guide Ryan, guide Nina, honorary Free Tour Stockholm child Aurora. In the summer of 2009, the newlyweds Annelie and Freddie bought two Interrail passes and traveled through Europe during a month. As students, they based their budget on lots of Nutella-eating and sleeping in 18 bed dorms. They still had a great time, and the best part of their trip was the free, tip-based tours that were given in several European cities. Without exception, these tours were funnier and more interesting than all other paid tours, which were expensive to boot. So when they returned back home to Stockholm, they decided to try the concept themselves, with Annelie as a guide and Freddie as an administrator. In August of 2010 Annelie gave the first tour to two German tourists who didn’t seem to speak much English but who were still very enthusiastic afterwards. Encouraged by this success, we’ve kept going since!